It had been over 10 years since my last trip to Amsterdam, and since 22 year old me had very different interests, I was more than ready to explore this city again. One of my musts was to stay on a houseboat in one of the gorgeous canals. We found one on Instagram (@avanceamsterdam) and I cannot recommend it enough. In case you're wondering, no it wasn't rocky at all. I am very sensitive to movement and I couldn't feel a thing. It was a large sailboat, with two bedrooms so that might be why. Ramen-Ya - Great Ramen Bowls in the Red Light District, sure to cure those munchies. It's large, semi-casual and cheap. Sampurna - for delicious Indonesian cuisine, something you must try when in Amsterdam. I ordered the sample plate with everything on it and it was the perfect way to experience as much as possible. The location is right in De 9 Straatjes (the 9 streets), which is the oldest, most photogenic part of the city. Brut de Mer - This adorable oyster bar is located in my favorite area, The Pijp, with shopping and cafes along cobblestone streets. There aren't as many tourists over here. Wijnnar Boelen and Boelen - Also in The Pijp, this winebar is perfect for sitting outside and people-watching over a glass of white Burgundy. Glouglou - A very cool natural wine bar in The Pijp. Any wine lover will want to stay here all day, the selection is super geeky and the wine posters on the wall are pretty awesome. 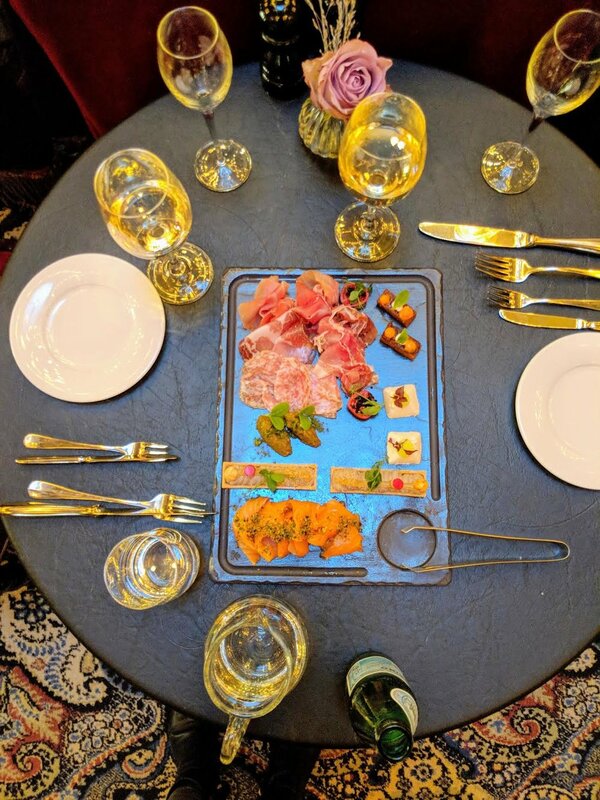 Wijnbar Paulus - A small wine bar with a great charcuterie board, closer to the center of the city. Morgan and Mees - A fantastic, local Mediterranean restaurant inside the beautiful hotel from the same name. Not cheap, totally worth it. Side Car Trip - We did another Air BnB "experience" and hopped on the back (and side) of a motorcycle to check out Amsterdam's neighboring villages. I HIGHLY recommend doing this. We went to Monnickendam, known for producing sailboats. The old buildings (back to the 1600s(!) in this town were breathtaking. We also stopped in Volendam, a small fishing village known for catching eel. My husband the picker found a few great antique shops and we left with some beautiful vintage oil painting. There's also an old hotel we stopped and had a drink in called The Spaander. There was a ton of very famous and traditional art in this hotel/restaurant, it was basically like a museum. Cotton Cake - If you're into shopping, this women's boutique in The Pijp is fantastic. High quality, great prices, I found way more than I could buy. The Hague is a beautiful city just 45 minutes Southwest of Amsterdam. It's known for being the home to the royal family. It's also where you can find Jan Vermeer's famous painting, “Girl With a Pearl Earring.” The cobblestone streets, tiny cafes and unique shops will keep you busy for days. I recommend renting a bike for at least one day, to cover the most ground, and because it's not as intense as biking in Amsterdam. I didn't see/hear one American tourist over the course of 4 days, which was refreshing after Amsterdam. Hotel Des Indes - This hotel is absolutely jaw-dropping. Built in the 1850s as a city palace to welcome royalty and celebrities, the architecture is mesmerizing. The decor has kept the original purpose with a canopy above the bed, velvet curtains and tassel-covered lamps. Staying here, you truly feel like royalty. The underground pool and spa is very relaxing and the massages were great. The best part of this hotel was the High Wine. This 5 course wine and food pairing was absolute heaven. Walter Benedict - A great little spot for coffee and a croque monsieur. It's beautifully designed and was packed with locals. 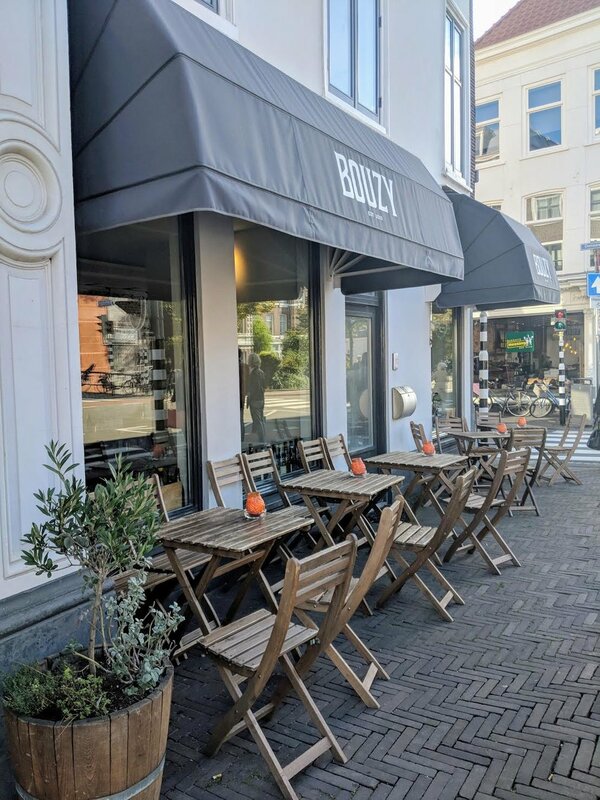 Bouzy - An outstanding, international wine bar that specializes in Champagne (hello, Bouzy). The bright, corner space makes it hard to leave, as do their small plates like homemade meatballs, shrimp and burrata. Nivoo - A cute wine bar, though more traditional in terms of offerings, in a great street for shopping. Hather Bar - An old fashioned pub with outdoor seating right over the canal. Food is pretty simple, but good. Tapisco - Great Spanish tapas in the city center. Great cured meats and empanadas. This area is quite touristy, but there are some beautifully designed government buildings around here.